ALBANY, NY (WSKG) – The state’s mayors are moving away from a state aid program for localities that they say has not been well funded in recent years, and are trying a new way to get the governor’s and the legislature’s attention as the 2019 state budget season approaches. For decades, mayors have received state aid for their cities through the Aid and Incentives to Municipalities program or AIM. But funding has been flat, in recent years, even though cities’ expenses have been steadily growing, as Governor Cuomo tried to hold the line on state spending increases. 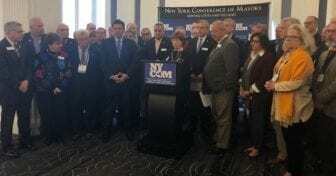 Schenectady Mayor Gary McCarthy, who is President of the New York State Conference of Mayors, says it’s time for a change . The mayors propose a new program that would be based on one of the governor’s favorite initiatives, the Regional Economic Development Councils. The mayors’ want a $100 million dollar fund that would be awarded to cities who are, among other things, following the economic development goals set out by the councils.